"Leading a team when you're only 16 is a big ask, but the Derby College course gave me confidence and was great experience." Taking a BTEC level 3 course in Public Services at Derby College has helped former Ilkeston student Josh Randall to prepare for an exciting life in the Royal Navy. 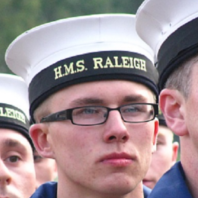 Josh, who completed his basic training at HMS Raleigh last October, joins his first ship this summer and can’t wait. Josh is from a military family (his dad was formerly in the army and his brother is currently a serving soldier) but had originally thought of doing something different when he left school. Finding out about the Royal Navy’s careers in hydrography changed all that though and he applied to join the service shortly after leaving school. As a hydrographer, Josh will be involved in mapping seas and oceans – a role which combines his love of science, geography and global travel. Josh, who is now 17, is so pleased he took the Derby College course before embarking on his naval career. He found the BTEC gave him greater insight into what to expect in the armed forces and provided him with useful information on legal aspects, such as The Geneva Convention.